High in Northern California, the Lower Klamath is a 100 mile stretch of free-flowing river, but most people raft or kayak the approximately 23 miles between Curly Jack and Dillon Creek Campgrounds. In between you’ll encounter many class II riffles like Mixmaster and Ferry Point. Bigger challenges await at class III sections like Windgate and Osprey. Along with plenty of rapids you’ll find many opportunities to hop out of your boat and swim, take a side hike, or spot birds if you packed binoculars and a guide book. Birds of prey–even Bald Eagles if you’re lucky–are a common site circling high above the river. People have even been known to spot bears–if that doesn’t add an extra thrill to your day then maybe river trips aren’t quite your gig. The Lower Klamath’s warm and sandy beaches are the perfect place to stretch out and relax after a day splashing around the river. 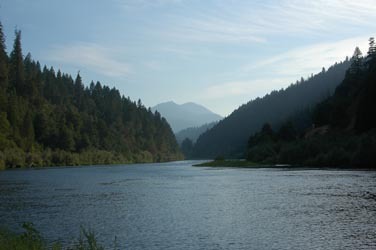 The Lower Klamath is the ideal family multi-day run. With warm water and tons of wildlife, the kids will never be bored. It’s also popular with school groups looking for a wilderness learning experience.